The Godfather: the greatest film of all time. Blu-Ray Disc: the most amazing way to watch movies at home. The Godfather on Blu-Ray Disc…let me take this in for a second. My awesome detector is overloading. Not only has the legendary trilogy arrived on Blu-Ray, but it arrives with (for the first two films) a meticulous, frame-by-frame restoration that took over a year to complete, as well as a huge slate of extras. This set should be an offer no fan…nay, no living human being could refuse. Is it? 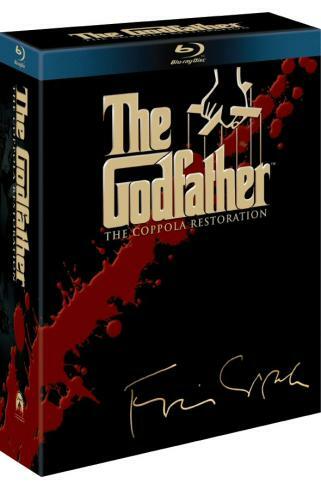 Find out in my review of The Godfather: The Coppola Restoration on Blu-Ray Disc. Francis Ford Coppola’s masterpieces have become part of the consciousness of the world. They are an element of our culture. People use quotes from the films in their daily lives, and the phrase “well, it may not be The Godfather” is used often by critics, including myself. The films aren’t just a piece of pop culture; they’ve integrated themselves into society, and are a benchmark that rests high above most other films. The first film, made in 1972, traces a lengthy period of time in the lives of the Corleone crime family. When Don Vito Corleone is shot, his sons take over the family, and relations between the five families of New York descends into war. Michael Corleone, who had previously had no part in his family’s business, starts working with the family, and as much as he tries to avoid it, events beyond his control turn him from an good man into a Don more ruthless than his father ever was. The Godfather is a rich, complex, multi-layered story that takes multiple viewings to fully comprehend. The huge cast of characters all feel like real people, with real problems and real decisions to make. Furthermore, relationships between characters are complex and multi-dimensional, with the family dynamic being the film’s strong suit. The film certainly contains the best cast ever assembled for a motion picture. The themes the film explores, through its plot and characters, are universal and always hit home. The music, the cinematography, the acting, the writing, the directing: it’s all perfect. They don’t call this film the best one ever made for nothing. The most amazing part, though, is that it gets better every time you watch it. The Godfather Part II is the greatest sequel ever made. Period. There’s debate as to which film is better, and I’ve always been on the fence, though I lean towards liking the original more simply for its characters. The sequel tells two stories; the main plot is Michael, a few years after becoming Don, dealing with multiple crisis that could bring the family crashing down. As he deals with them, he becomes even more ruthless, alienates everyone around him, and while he avoids crisis, he leaves the family in ruins. The other story, which is intercut with Michael’s plot, it of Vito Corleone coming to America, starting a family, and his rise to power. This inter-cutting of stories is one of the most brilliant cinematic devices in film history. Showing a father and a son both at roughly equal points in their lives is a terrific way to tell a story, and adds tremendous depth to the film. Because of this, though, the film becomes very depressing and sometimes disturbing. Vito was not a hero or anything, but he operated with honor and would never alienate or intentionally harm his family, and we see lots of that in the flashbacks; he was a ‘good’ gangster. Michael, however, is evil to the core, as evidenced by the things he does, especially in the last half of the film. The ending, with Michael sitting alone and contemplating his life, is a haunting summation of the entire film. My favorite scenes are the ones with Vito, who is played with expertise by Robert DiNiro, who seemingly effortlessly matches up with Marlon Brando. Many of these scenes are interesting, deep, and inventive, the scene where Vito kills Fanucci and dumps his gun in the chimneys being a prime example. I still don’t know which film I like more, but there’s no doubt about it; Godfather II is legendary, and for good reason. People love to complain about Part III, but it’s not that bad. In fact, it’s quite good, but obviously not on par with the first two films. Nowadays, it’s common for a film series to be revived with a third or fourth installment (Die Hard 4, Rocky 6, Indiana Jones 4) and Part III is akin to those movies; it’s different, but still retains the essence of the series and is fun to watch. The biggest problem with the film is that it’s 100 percent unnecessary; Part II’s conclusion is definitive, and I have to give Coppola and Puzo props for figuring out how to continue the story. They do it in the best way possible. The plot revolves around a conspiracy involving the Vatican and other mafia leaders, and that whole story is probably the area with the film shows the greatest weakness when compared to parts I and II. But what the film is really about is Michael’s attempted redemption; this is a very different Michael then we’ve seen before. He’s old, and he’s truly sorry for the horrible things that he’s done. But karma is cruel, and Coppola and Puzo are relentless in bringing Michael’s life crashing down upon him. The film isn’t a masterpiece, but it’s a worthy successor and conclusion to the series. My favorite character and element of the film is Vincent, played by Andy Garcia, who has great chemistry with Michael and is a terrific character. The weakest link in the cast, and perhaps the picture as a whole, is the amateur performance by Sofia Coppola as Mary Corleone. I don’t think she’s as bad as everything thinks, but the performance is bad. She’s flat and unexpressive in most scenes, with her best moments being ones with Vincent; the climax of the film hits home a lot less harder than it should due to her weak performance. Still, while the film isn’t a masterpiece, it’s a worthy successor and conclusion to the series. If you’re reading this, then chances are that all you really care about is how the films look. Simply put: this is not the kind of HD you use as demo material, but I’ve never experienced an image so satisfying in HD. First, we’ll talk about Parts I and II, which were shot just two years apart and feature identical visual styles. For this release, a multi-million dollar restoration was preformed, with the aim being to create a new master of the film that brings the image to its original glory. Robert A. Harris (who headed up the restoration) and his team should be very, very proud of themselves, because they’ve restored the films to a quality that hasn’t been seen since the films were in theaters in the early 70’s. The first two films have a distinct visual style that, for indoor scenes, crushes the blacks until there’s nothing left and enhances the grain to give an “old-timey” feel. Outdoor scenes feature over-saturated whites and colors that, while vibrant, aren’t exactly what you’d see in real life. Previous home video releases (DVD and VHS alike) have been unable to render these colors or the grain level properly, but the restoration perfectly matches the colors to how they should look, and does it without sacrificing the grainy quality of the image. Most of the dirt and scratches have been removed, resulting in a clean, crystal-clear master that will let these films last through the ages. This set is available on DVD, but you have to see it on Blu-Ray to appreciate the restoration. The colors are incredibly vibrant and accurate, and the entire image is incredibly detailed considering the age of the films. Facial features, furniture detail, decorations, and outdoor elements like grass and buildings have been rendered with astonishing sharpness. Sometimes, in both films, excessive grain does appear along with softness (the hospital sequence), but it’s always brief and doesn’t detract from the overall image quality. If you really want to show a friend how amazing the films look in HD, show them the sequences in Sicily, along with some of the darker indoor scenes, to demonstrate how the Blu-Ray encompasses a wide array of visual styles and does it all with precision. The highest praise I can give this image is that it looks as though I am watching a 35mm print being projected onto my screen. It’s by far the most film-like image I’ve ever scene, on Blu-Ray or DVD. Part III has not been restored, but it didn’t need to be, seeing as it’s by far the newest film and that the elements have been kept in better shape. As such, it’s the best looking film in the set. Part III has a different look than the first two films; it’s brighter, there’s less grain, etc., all done to illustrate that this was a separate part of the story. This means that in hi-def, the film is simply stunning, and looks like it was shot yesterday. Detail is sharp as a knife, with many scenes look like a view from a window. Facial features, building details, and nature shots (the scenes in Sicily are, again, particularly amazing) are all rendered flawlessly. Like the first two films, hi-def has not compromised the look of the film. It looks exactly as it should, which is different from the first two films. The audio is roughly equal on all three, though there is a noticeable difference in quality when you reach Part III. For the first two, dialogue, music, and sound effects are all balanced and extremely crisp. The gunfire is the best example of how good the audio is. Of course, the audio doesn’t show as much of an improvement over previous releases as the image does, but it’s definitely better, and the TrueHD track makes it sound amazing, if a little dated. All of this is true for Part III, though the audio track sounds brand new and not dated in the least. If this set came with the films in HD with nothing else, then I would still buy it. The experience of watching these films on Blu-Ray is astounding, and every fan of the film should see this outstanding BD presentation. The 2001 DVD may have had lackluster video quality, but it made up for that in the staggering array of supplements. I couldn’t really imagine improving on that batch of features, but Paramount has done it; the extras round out what is, without a doubt, the best Blu-Ray (or DVD) set of the year. Each film contains an Audio Commentary with Francis Ford Coppola that was on the DVD set as well, and I’ll admit that despite owning the original set for years, I’ve never had the chance to listen to the entire commentary for any film. For this review, I’ve listened to more of the commentaries, and let me assure you, these are still some of the best commentaries ever recorded. Coppola is a friendly presence, and he always has something fascinating to say. He doesn’t repeat comments, and there’s a surprisingly small amount of silent spots considering the nine hours of talking he had to do. If you’re ever home sick and need something to do, sit down and listen to these commentaries. If they were the only extras, the supplements would still be comprehensive. But they aren’t the only extras; not by a long shot. The fourth disc in this set is devoted entirely to Bonus Features. The disc starts off with six brand new featurettes, all featuring interviews with Coppola and other crew members, as well as friends of Coppola and other people in the film industry, like Steven Spielberg and George Lucas. These six featurettes are all in full HD, and look great. While everything in the featurettes is interesting, some of it gets repetitive and only two of them have an absolutely clear focus. The Masterpiece That Almost Wasn’t tells the story of how the film got started, and how Coppola had to fight studio heads all the way. This is extremely interesting, but about halfway through, the piece switches focus to a bunch of actors and filmmakers talking about how much they love the movie. It feels like a different featurette, and gets old fast. Another one of the new featurettes, When The Shooting Stopped, feels like it should be the last half of Masterpiece, and not a separate entity. It talks about the challenges faced in editing and various things the filmmakers realized while putting the movie together, and is fascinating to watch. Emulsional Rescue: Revealing The Godfather is a documentary about the restoration done for the first two films for this release. Gordon Willis, cinematographer, is a strong presence in this part, and the look of the film is heavily discussed. Then we get into the real technical stuff about how they meticulously restored the picture, and it’s simply amazing. Robert A. Harris, who writes for my favorite DVD site, The Digital Bits, was the head of the restoration process, and leads us through the project from start to finish. It took over a year to restore the two films, and watching the movies in HD shows that it was worth it. This is my favorite one of the new features. Godfather World focuses on how the films have influenced pop culture, including clips from The Simpsons, The Sopranos, Family Guy, etc. The Godfather on the Red Carpet is a very fluffy piece where actors are stopped by interviewers to talk about the film; it looks like it was shot on red carpet for Cloverfield. This is pretty much worthless. Finally, Four Short Films on The Godfather isn’t really a collection of short films, but a collection of four skits or anecdotes by the filmmakers. It’s interesting, but feels rather pointless. The new bonuses, besides Red Carpet, are all worth watching, but they do get a bit repetitive. Still, I haven’t even skimmed the surface of what this disc holds. The interactive Family Tree and Crime Organization Chart have been taken from the old DVD and put into HD, and are really fun to spend some time with. From the main menu, you can also access the 2001 DVD Archive, which takes you to a menu that looks exactly like the 2001 DVD bonus disc, complete with every single feature from the original release, easter eggs and all. I won’t go into detail about everything that’s contained here, but don’t be fooled, there’s a TON of content. The highlights are the excellent A Look Inside documentary (filmed at the release of Godfather III, it’s a comprehensive making-of), the extensive set of Deleted Scenes (which have not been restored or put in HD, though that would have been asking too much), and multiple miscellaneous interviews with various cast and crew members. In short, you get three commentaries, over an hour of new material in HD, and every single supplement from the old DVD. You could spend a whole afternoon enjoying just the bonus disc, and still not see everything. This is the ultimate collection of information on the series. As for presentation, the four discs are housed in Blu-Ray case that’s not much bigger than a normal case; because of this, discs one and four are housed in a way that makes them very tough to get out, and discs two and three fall out easily. It’s not perfect, but it’s good enough. That case is housed in a cardboard box, which has a booklet about the set stuck to the outside. It doesn’t fit inside the cardboard box, but I trimmed just a tiny bit off the top and got it to fit. The whole thing is compact and looks good on the shelf. Parts I and II of the series are my favorite movies of all time, and this is a set worthy of their legacy. The image is miraculous, an enlightening experience to watch; it’s everything I could have hoped for. The extras are equally impressive, with new and old features that consistently impress. This is the definitive collection of the films; it’s the best Blu-Ray set of the year, and one of the crown jewels of my home video library. If you don’t own a BD player, this set is available on DVD, but I would wait until you do own a BD player to pick it up; in fact, this might be your excuse to invest in one. It’s an offer you can’t refuse.